I know it’s just February, but remember how things were last May, June, July, August? Were there too many flies? Were they bothering your rabbits, yourself, your neighbors? It’s not too early to think about implementing some sort of fly and mosquito abatement programs around your barn or pet rabbits. The good thing is - there are safe, natural, and very easy solutions, thanks to Spalding Labs. Fly predators are a tiny little fly. 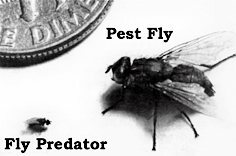 They are called "fly predators" because they hunt out and lay their eggs in house fly and horse fly pupae (cocoons). The predator larvae eat the fly pupae, killing them and giving life to the growing fly predators. This eliminates the flies at the source. Once the flies buzzing around your head die off, there will be no more flies. Fly predators never bother people or animals. All they care about is finding fly pupae (cocoons) for their eggs. I’ve used them for several years very successfully. Seriously, once I tear open the packet, the predator flies are out of sight and out of mind, and so, soon, are the barn flies. Spalding Labs will ask you where you live. Then, they’ll send you a packet of Fly Predators every 4 weeks throughout your local fly season. When the packet comes, you rip it open and dump the contents of the packet on or near the main source of flies, for example, rabbit manure. Easy peasy. I am happy to report that Spalding Labs now offers several types of fly traps which will give you a jump-start on ridding your barn of already hatched flies, or those that originate from over 1/4 mile away. There’s a system to choosing which trap to use and how to place it correctly. Learn more at the Spalding website. At the height of summer, our rabbits’ noses are pierced and reddened over the top with mosquito bites. We have a pond nearby, and despite dropping those Bti dunks into the water, we still have lots of mosquitoes every summer evening. New for 2014 is an exciting, all-natural method to control mosquitoes from Spalding Labs that is just as simple as dropping a “Mosquito Torpedo” into standing water. These ‘torpedoes’ contain an insect growth regulator (IGR, or S-Methoprene). The presence of S-Methoprene in the water prevents the mosquito larvae from maturing into adults. Happily, IGR is completely safe for people, livestock, fish, frogs, birds, etc. In fact, human drinking water is similarly treated in countries with a high malaria risk. Now would be a great time to order safe and natural biological mosquito control by Spalding Labs. I know it’s still early to be thinking about flies and mosquitoes, but it is not too early to start planning how you’ll be fly-free and mosquito-free throughout the spring and summer to come. I am raising the Texas A&M breed of New Zealand. I started with 13 to learn the basics and kept one buck and five does to start production. My first new litter is about three weeks from harvest. This is the best website I've found for walking the rabbit newbie through the process. I turn to the site for each step of the process and whenever problems arise. I really appreciate the personalized responses to questions. Thanks! Thank you very much Roscoe! It means we’re fulfilling our mission of providing comprehensive rabbit information for every facet of raising and breeding rabbits as pets, or for meat, show and fur. We’ll thankfully add Roscoe’s comments to our Compliments page. If Raising-Rabbits.com has been helpful to you, you may also like one or more of our World of Raising Rabbits e-books. Much more info at the linked page. What do you do when you have two or more pet rabbits, and one of them starts sneezing? Any pet rabbit owner with two or more rabbits may eventually run into this situation, and because sneezing in rabbits is usually a serious health challenge, it is wise to plan ahead what should be done for the rabbits. Below: this rabbit has a very damp nose and wet mats on its forepaws. Good news for this rabbit - it got better. Unfortunately, rabbits don’t "catch cold." When a rabbit starts sneezing, the problem might be mechanical. But if not, it is nearly always bacterial. The two most common culprits are Bordetella bronchiseptica and Pasteurella multocida. Bordetellosis is much more treatable than is pasteurellosis. 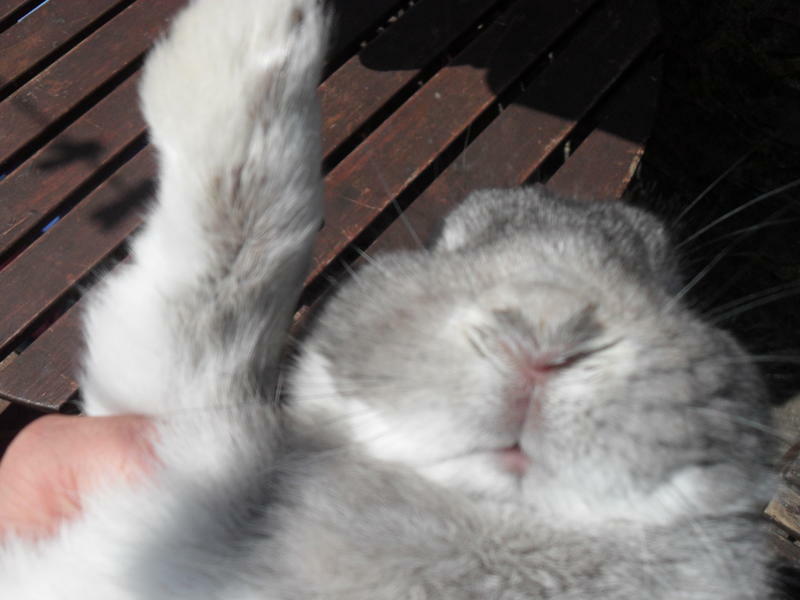 So, what should you do if one of your rabbits starts sneezing? Do some quick troubleshooting. Are the symptoms due to an infection, or is it nothing more than a foreign body in the nose? Troubleshooting and treatment recommendations for Pasteurella bacteria are here. Quarantine the rabbit. Separate it from all the other rabbits to limit or eliminate the communication of its germs to the other rabbits. Feed the rabbits separately, and take care of the needs of the sick rabbit only after you have fully cared for the well rabbits. Don’t hug or cuddle the rabbit until AFTER you’ve cared for the well rabbits, and don’t go back to the well rabbits until you’ve changed your clothes and either showered or washed your arms up to the elbows or armpits. Get a professional veterinary opinion as soon as possible. This is because early treatment may improve the rabbit’s chances for wellness. Return the rabbit to its bunny-friends only after the sneezing and any other symptoms have been eliminated. --Euthanization, if the rabbit is clearly very sick and suffering. Have you already experienced a similar situation? How did you handle it? Let us know! 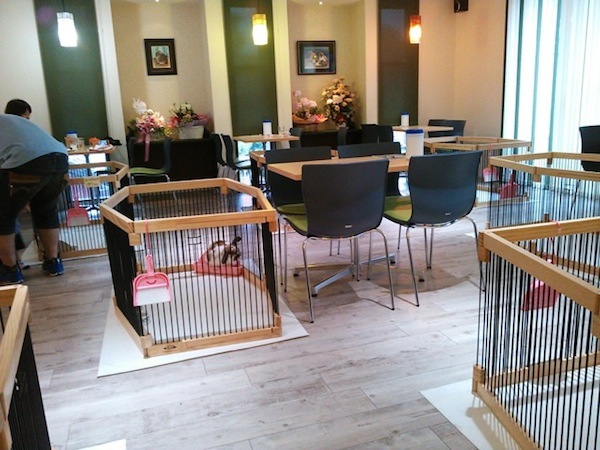 Here's a concept I've never heard of...till now - Japanese pet cafes! Can you imagine - you head to the local restaurant, where you eat your food, drink your coffee, and cuddle and stroke the well-handled little pet bunny in the corral snuggled up to your table. How cool is that! And if you like, some of these eateries have rabbitries around back; you can choose yourself a pet rabbit and take it home with you. January 23, 2014: Canmore, AB, Canada, has had problems with a feral rabbit population of some 2,000. The town leadership voted to allocate $60,000 annually to the trapping and eradication of these feral domestic rabbits, the offspring of pets that were released over the last 10 years. But animal rights representatives had a hard time stomaching this approach and brought a court case requesting an injunction against the trapping and killing, reasoning that altering and relocating the rabbits would be a better approach. Both the provincial and national supreme courts dismissed the case. The trapping and killing will continue. Best to address the problem firmly before the numbers climb any higher. Controlling a burgeoning rabbit population is the stuff of nightmares down under. In Australia, the feral rabbit population numbers more than 100 MILLION rabbits and rising. Rabbits cause $200 million in agricultural losses every year, all because a titled settler released a dozen domestic rabbits 150 years ago. Two fatal rabbit diseases, myxomatosis and calicivirus (rabbit hemorrhagic disease), were released into the wild, initially decimating the rabbit population. But the surviving rabbits’ immune systems rebounded along with their populations. On January 24, 2014, farmers in West Australia were asked to keep their eyes peeled for evidence of dead or diseased rabbits and to report it if found. This was in order to plan a new attempt to annihilate feral rabbits through the release of a more virulent and more effective strain of calicivirus into the countryside. I’m not sure why they think it will work this time, since two prior attempts offered only temporary reductions in rabbit numbers. Forward this email to your friends! Now you can ‘like’ us right on every page of Raising-Rabbits.com! Your friends at Raising-Rabbits.com wish you a wonderful February 2014.